This program is designed for students wishing to gain insight into the history, culture and development of Eastern and Central Europe by taking courses taught in English across a range of subject fields including art and culture, film, economics and politics, history, Czech language, literature, psychology, sociology and theater. The program begins with a required 2-week orientation in Czech language and culture. 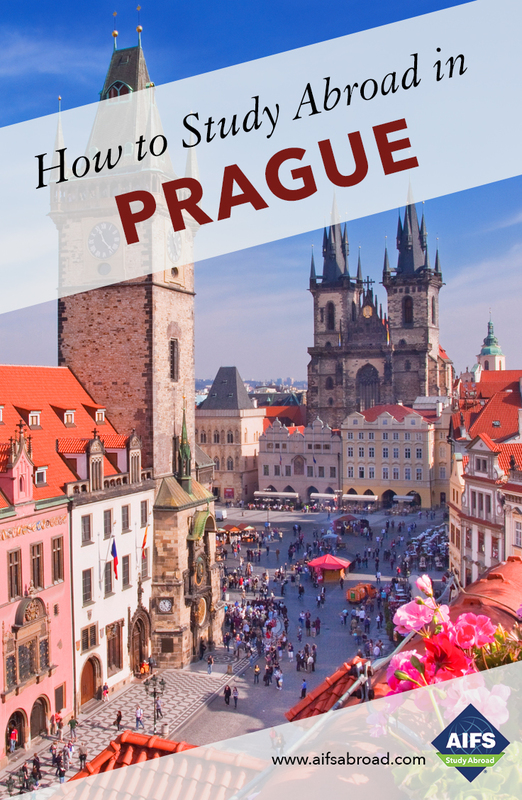 This includes Czech language instruction, cultural activities and excursions throughout Prague to help you to adjust and make the transition to living in the Czech Republic as smooth as possible. Classes are held for 4.5 hours per day, 5 days a week for the first 2 weeks of the program for a total of 45 contact hours. Two all-day field trips are also included. The orientation component carries a recommended 3 credits. Following orientation ECES students then take a minimum of 4 or a maximum of 5 courses. Each course meets for 52 hours per semester, for 12 or 13 weeks and is recommended for 3 credits. You can therefore earn up to 18 credits (including the 3-credit orientation component). Courses are taught in English. No AIFS participant is permitted to take a course without receiving a letter grade. Pass/fail options are not available except for the Czech Language and Culture course during orientation. In a globalized world, practical experience in an international environment is an invaluable addition to classroom learning. Students in Prague may take a 3-credit International Internship, offered and accredited by Richmond, the American International University in London. Richmond is an independent, non-profit international university of liberal arts and professional studies with a student population of approximately 1,500. It is accredited by the Commission on Higher Education of the Middle States Association of Colleges and Schools, one of the regional accrediting bodies recognized by the U.S Department of Education. In addition to the U.S. degree granting authority, it has U.K. taught degree awarding powers granted by the U.K. Privy Council. It is the first university in the U.K. to have dual degree awarding powers. Students will receive credit from Richmond for the internship course. In addition to the internship, students select up to 4 courses from the East and Central European Studies Program (ECES) at Charles University. Internships are arranged by the Internship coordinator, after an assessment of the student’s eligibility based on skills, interests and abilities in relation to what the organization needs. All academic aspects of the program are monitored and assessed by the Internship Coordinator and by Richmond faculty supervisors. Interns will be engaged in different fields ranging from production, marketing, IT and administrative assistant placements with the Prague Shakespeare Company to teaching English in a local elementary school. Students may work in small or large organizations, located in different areas of the city. Students must attend interviews with suitable organizations; this is a competitive process. Final selection is always at the discretion of the organization and the Internship Program is not able to honor specific requests to join a particular organization or guarantee that students will be successful at interviewing. The AIFS Office is right in the heart of the city in one of the oldest parts of Prague conveniently located within walking distance of the University. There is a student center and a computer lab in the office, with PCs for college work or leisure. Free printing is also available, making it ideal for students to print their projects and essays on their way to class. Staff are always there to help with any issues that might arise. Charles University is the oldest university in Central Europe having been founded as Prague University in 1348 by Charles IV, King of Bohemia and of the Romans. The University continued to develop until all Czech universities were closed during the Nazi occupation in World War II. Charles University reopened again in 1945 under Communist rule. The Velvet Revolution of 1989 saw students and faculty at Charles University fight for the social and academic freedom enjoyed today. Initially made up of 4 academic faculties (liberal arts, medicine, law, and theology) this public university now boasts 17 faculties and many of the University buildings such as the beautiful Carolinum in the Old Town are historic monuments which draw visitors interested in various architectural styles. Currently hosting more than 20,000 undergraduate and 25,000 graduate students, it is the largest and most prestigious academic institution in the Czech Republic with a reputation for international research and the creativity of its teaching. Charles University has partnerships with over 170 foreign universities and has hosted international students from its beginning. Former students include the author Franz Kafka who enrolled at Charles University in 1901 for eight semesters of law school.